Nothing beats a live goggle-eye fished on the surface using a kite for south Florida sailfish. This go-to quick bridle rig allows your baits to swim naturally and helps them stay alive much longer by keeping the hook out of the bait's body. All you need is a 5/0 circle hook, rubber bands and a rigging needle. Story and photos by Hunter Ledbetter / hunterledbetterphotos.com. When the action heats up along the reef, you'll want to keep a supply of rubber bands and rigging needles handy and easy to access. All you need is a setup like this to rig up live baits on the fly. Start by attaching your circle hook to the rubber band. Thread the other end of the rubber band onto the end of the rigging needle. 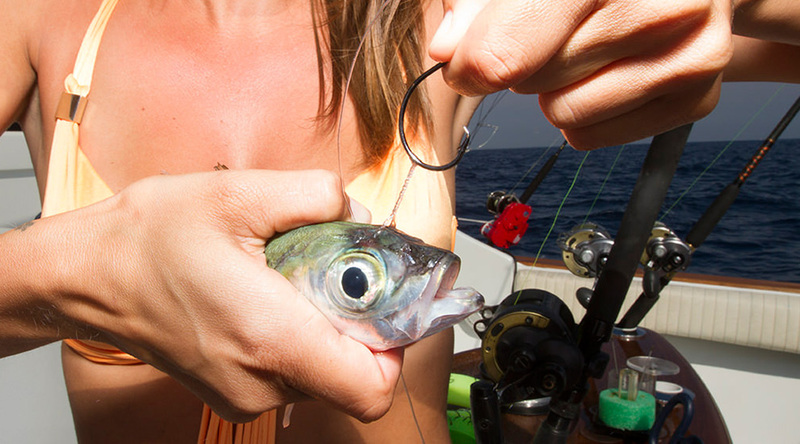 Gently slide the rigging needle into the fish's eye socket at the very top, being careful to not damage the eyes. Push the needle out the other side, keeping it as high in the eye socket as possible. Pull the rubber band all the way through until the hook bend is flush with the right eye socket. Take the rubber band off the needle and slip the band over the point of the hook. Squeeze the two ends of the band together on the bend of the hook and twist the band tight up against the bait's head. Then, push the point of the hook through the space between the rubber band and the bait's head. Make sure the hook is pointing forward. Your kite should already be flying high before you start to rig your baits. For our sailfish rods we use a 20-pound main line with a 40-pound mono or flouro leader, joined by a Bimini twist and improved Albright knot. 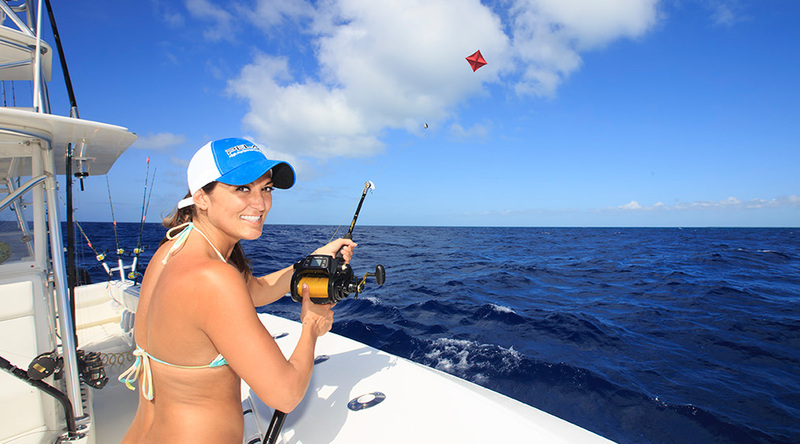 After you clip your fishing line to your kite line, you are ready to get the bait in the water and out into the strike zone. We typically run three baits on each kite line and one or two baits off the boat as flat lines. The Atlantic sailfish fishery is very robust in South Florida, making it not uncommon for boats to score double-digit days as the sails migrate through. If you decide to take a sailfish out of the water for a quick picture, get it back in the water a soon an possible. Make sure the fish is fully revived boatside before releasing it. 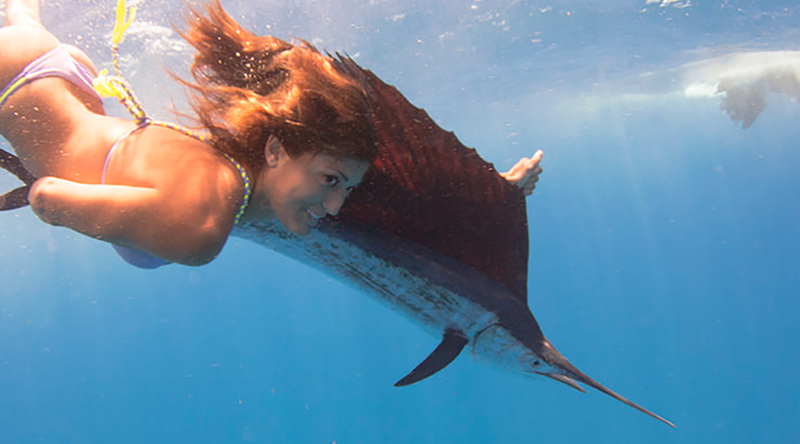 Of course, it's always better to leave the fish in the water for the release, and Alysha gets in the spirit with the best send-off a sailfish could ask for.